I have several important dates in rapid-fire in the next few weeks! Tomorrow I am firing my kiln, ^10, with work for Monkitree, On the Main, and Kennebec River Artisans, and some mugs for Phil at Bay View Company. A May Day firing, that's got to be good luck, right? I'm feeling really good about these pieces: I've finally learned that taking my time wiht the glazing is key to getting "wow" instead of "meh." Here's hoping for WOW. 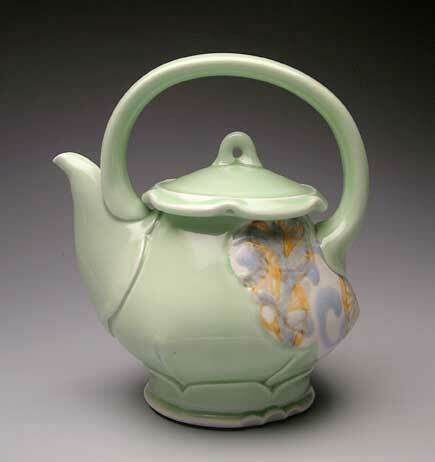 Friday Portland Pottery's Annual Teapot Show opens! 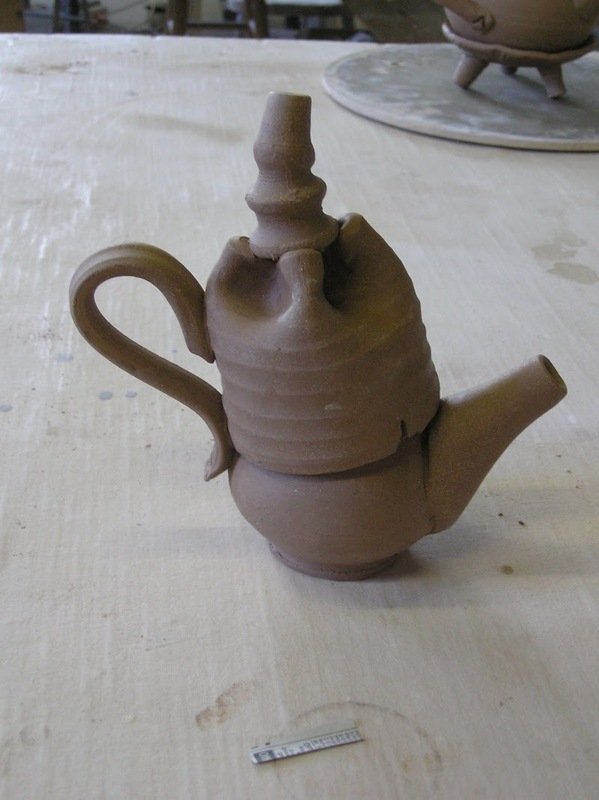 The image is a teapot which will be in the show, made by my friend Diane Aromando. I'll have work in the show, too, as will several of my students. 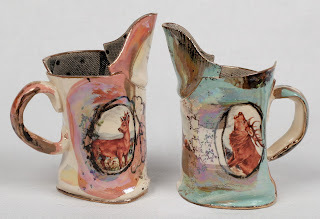 Saturday and Sunday I am teaching a soda firing workshop offered by Portland Pottery at The Watershed Center for Ceramic Arts. This is the first time we've offered this workshop, though I've done a couple of small ones at home. 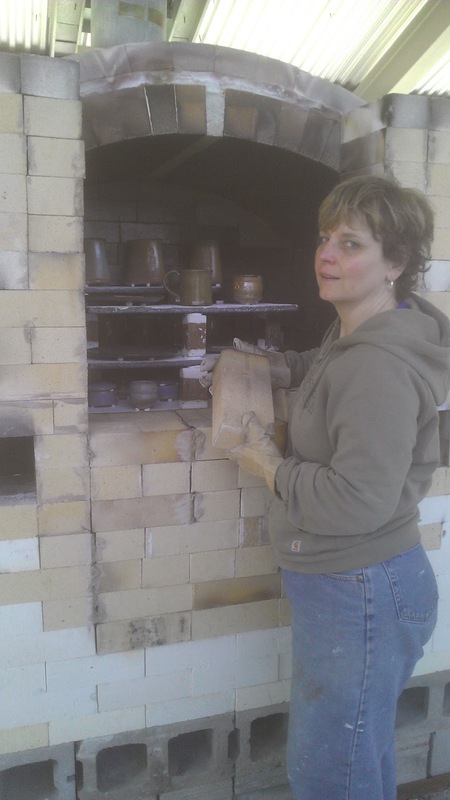 Saturday we'll be glazing and loading, and on Sunday we'll fire the kiln. The workshop is full with 10 participants, but we're hoping to do it again in the fall, if you're interested. On Wednesday we'll unload the firing from the workshop. Pics, or it never happened! Thursday I'm at Cony High School here in Augusta, doing throwing demos. 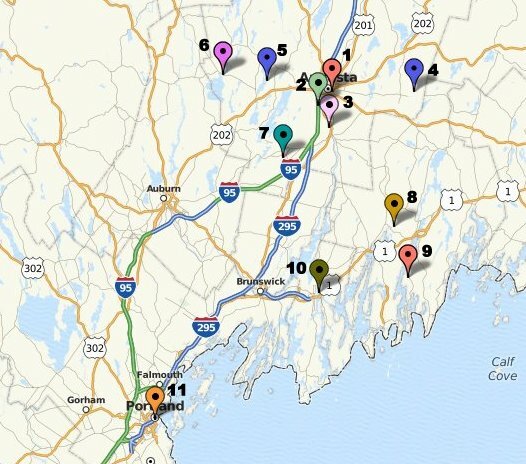 The Maine Pottery Tour is happening on Saturday & Sunday!! 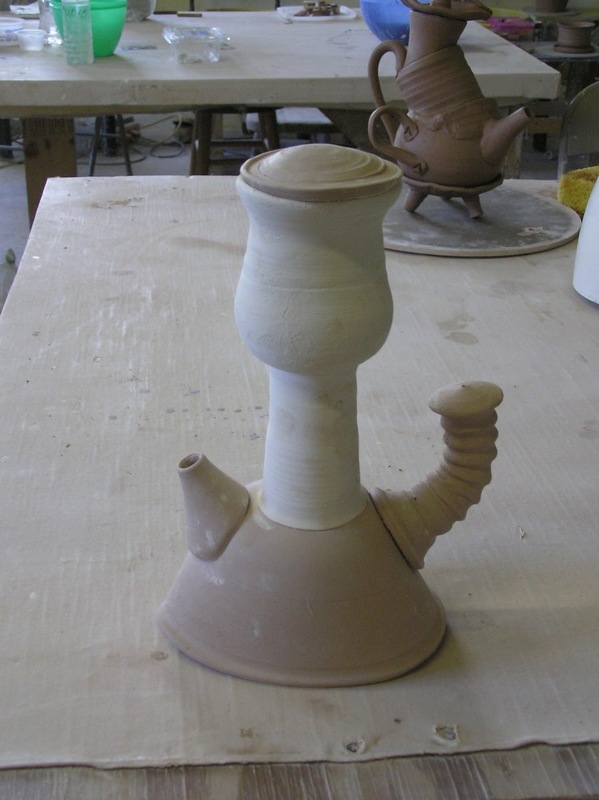 After that I can perhaps breathe, although in between all that stuff I will be throwing both ^10 and ^6 - I'd like to do another firing of each in May. See that nice orange oval? 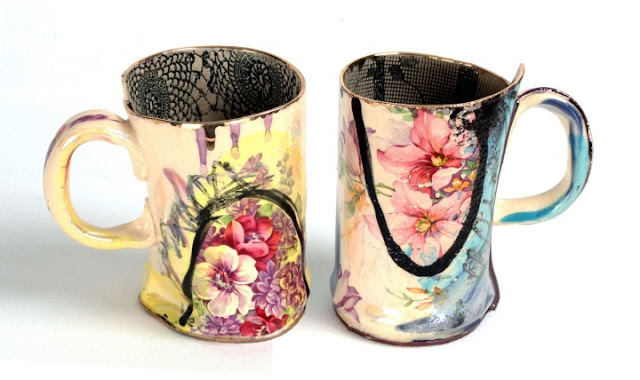 Liz Proffetty made that - it's a test piece, quite different from what Liz usually makes; but guess - go on, guess! - what is creating that great, brilliant red-orange on the interior. Give up? It's a ball clay sig. One ingredient: ball clay. And it's on the inside, so we know it will turn even if it doesn't get much soda. I am taking a break right now from loading a ^10 kiln, mine here at home. I am thinking it will fire on Wednesday. Then I am teaching a soda-firing workshop at Watershed, offered through Portland Pottery. Whole lot of firing going on! It was a loose stack, but not ridiculously so. We went into body reduction at 012, just as with a ^10 firing, then into a light climbing reduction until ^4 started to bend. We added the soda when ^5 was soft. When firing at home, I add my soda ash/ baking soda combination in a mixture with wood curls and water, on a length of angle iron the way one would add salt to a kiln. (Somewhere around here I have a video clip of this. I am too lazy to look for it right now but will post it this weekend.) During another firing of Watershed's soda kiln, I used that method and the resulting pots were quite dry - not sure if it was due to the method or not, but to be on the safe side I thought we should try the more conventional approach. Watershed's kiln is built differently than mine, and the ports are much higher...I don't know why that should affect anything but maybe it does. Unloading Saturday! Pics to follow. See lots more of Vanessa's lovely work here. This morning I am glazing for the first official test firing of my project. Me and two buddies - excuse me, two buddies and I - are planning to fire ^6 reduction soda in Watershed's new spring arch soda kiln on Thursday, loading tomorrow. 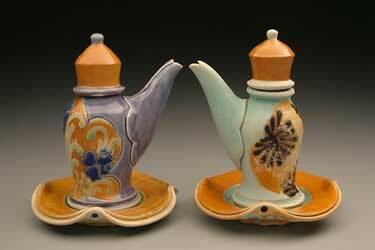 My buddies are Malley Weber, of Hallowell Clayworks, and Liz Proffetty, a potter from Newcastle. It quickly became clear that I was not going to figure out the glaze calculation software in time to use it to re-write my own glazes for this firing, so I went with Plan B, and mixed up a bunch of recipes that I've gathered from various sources. 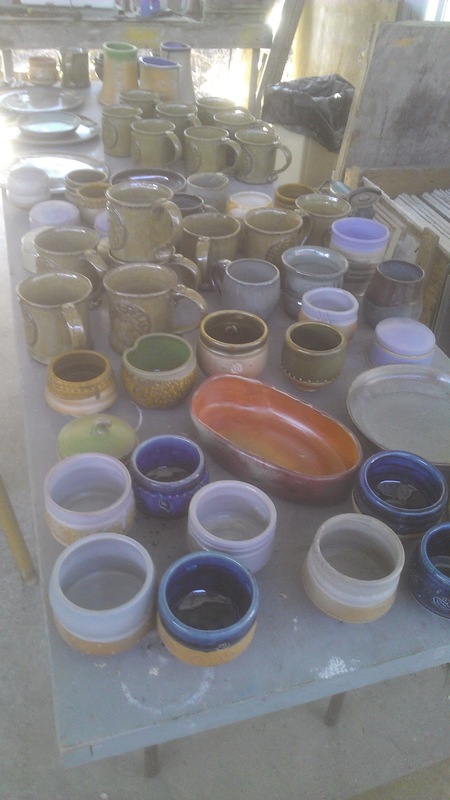 I'll be testing seven glazes, two flashing slips, and stained trailing slip, and an underglaze. Malley and Liz will bring their own test, so hoping for a very informative firing! 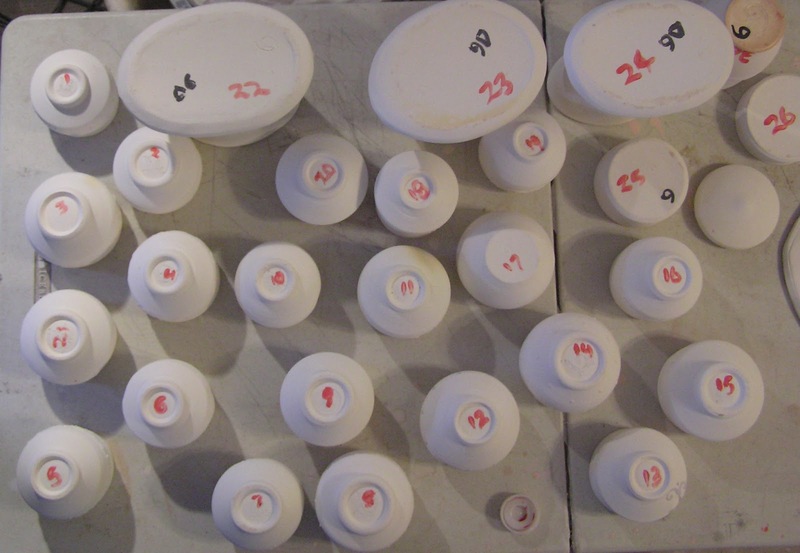 I've numbered all the bottoms of the test pieces, in order to not be half-assed: I am writing down what glazes, slips, and combinations are on each piece, instead of pretending I'll remember, or assuming it will be obvious. Since the Insight instructional videos proved pretty useless for me, I plan to spend the hours of the firing reading the 139 page manual. Big fun! In my quest to translate my soda glaze palette to Cone 6, I've downloaded the Insight Glaze Calculation software. Why do things the hard way? Right now I've got the trial version but I can see how this software would pay for itself over time - assuming I can ever figure it out! That's my task today. 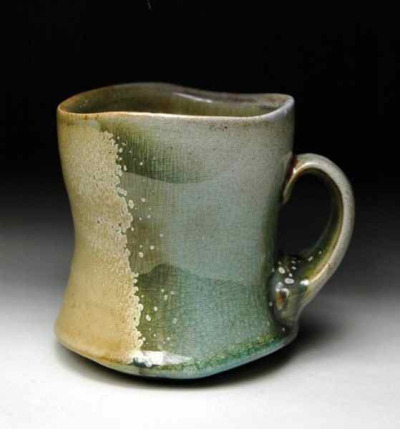 I get asked a lot why I don't just use glazes that are already on the web. Julia Galloway is one potter who has graciously shared her yummy recipes with the world, and there are certainly others. It's hard to explain, but it's important to me to increase the sum of glaze recipes available to potters who would like to go the ^6 route. We can't all just utilize the recipes of a few. I see nothing wrong with using others' recipes - I do it all the time, and make my recipes available as well - but I also want to contribute to the sum of resources out there. Not everyone has that option, but I do. So: Insight! I thought I could just sit down and start entering recipes, but looking at this screen, that's not gonna work. Fortunately Insight comes with an instruction manual. A 139-page instruction manual. EDIT: Lucky me. DigitalFire has a whole section of video tutorials! Gonna check those out first. As sometimes happens when I have a big job ahead of me, I sort of went dark there for awhile, and posts got scarcer. 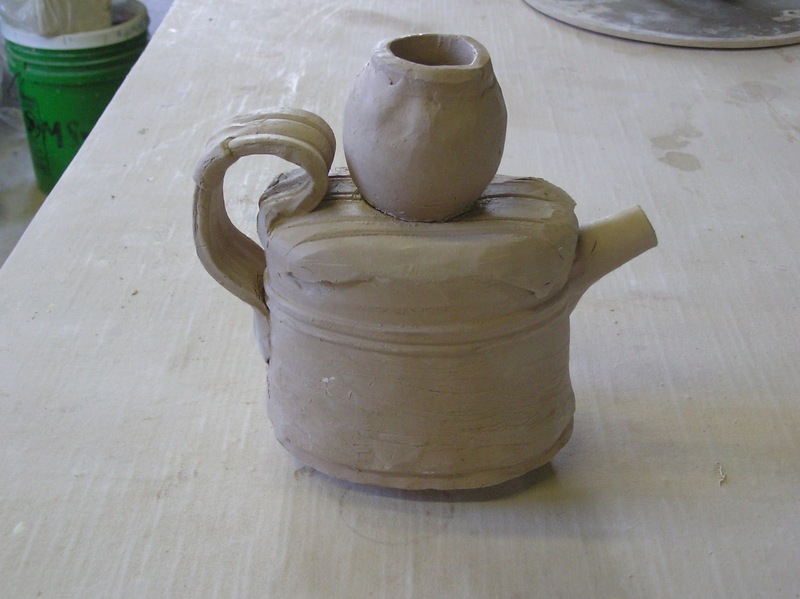 Not because I haven't been busy - believe me, I have - but because I was feeling a bit overwhelmed, and then, every time I felt like blogging again, awful things happened in the larger world that made writing about clay seem utterly meaningless. Like the whole country I was horrified by the bombings at the Boston Marathon, and by the explosion in West, Texas. My heart goes out to the victims and their families in both tragedies. I have friends who are doing CraftBoston this weekend; on Friday they were under the Shelter in Place zone which Mayor Menino requested of the city, so of course the show was closed for the first day. Sheltering in place is pretty sucky even if you are at home, with your loved ones and your books, not to mention your refrigerator; I imagine it's just that much suckier if you are stuck in an exhibit hall, eating from vending machines and kicking your heels without even a comfortable chair to sit in. Here's hoping the rest of the show is spectacular. Boston Strong! See lots more of Christopher's wonderful work here. We all say we support the troops, right? However we may feel about the wars, all Americans of good heart want our troops to come home safely, to live well and have productive civilian lives. This goes double for disabled veterans, who have given so much for our country. With that in mind, I want to call your attention to a young lady I met online during my Kickstarter promotion. 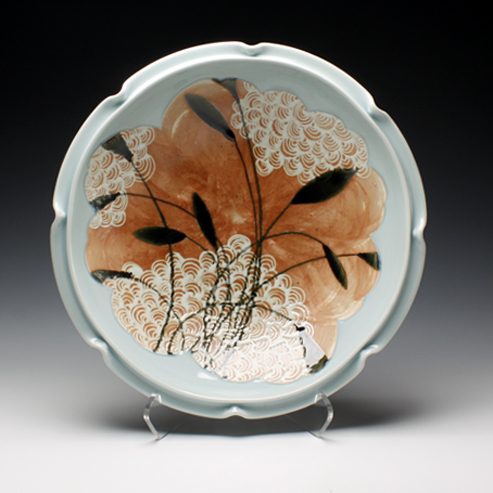 Shawna Mayo is a disabled vet turned potter from Fort Kent, Maine. Clay is helping her to heal, both mentally and physically. Due to her physical limitations, Shawna needs a de-airing pug mill to be more independent as a ceramic artist. I am supporting this project, and helping to get the word out, as a small but tangible way of walking the walk of supporting the troops.You can read more about Shawna's project here. Hunter-gatherers living in glacial conditions used pots for cooking fish, a new study suggests. According to the findings led by the University of York, this is the earliest direct evidence for the use of ceramic vessels. Scientists from the UK, the Netherlands, Sweden and Japan carried out chemical analysis of food residues in pottery up to 15,000 years old from the late glacial period, the oldest pottery so far investigated. It is the first study to directly address the often posed question why humans made pots? The question of why glacial-era humans made pots strikes me as a stupid one: because it's fun, duh. J/K. But really, is that such a mystery? If they knew how to make vessels from readily available material that could store food and other items against scavengers, dirt, and weather; keep water cool; provide a cinder-free cooking experience; and be almost endlessly reusable, why in the world wouldn't they? Why did early humans make pots? Because they could. The more interesting question to me is, how did humans discover the fire-able quality of clay: how did human-induced quartz inversion first occur? I can tell myself a little story about a clay-lined cooking basket catching fire and getting hot enough to give someone an inkling of what clay could do, but it's only a story. Absent a time machine, guesses are all we've got. Once in a while I invite my intermediate and advanced students to play a game called Building Blocks: we each throw two "torsos" - pieces large enough to become the main body of a pot - and three to five additions - spouts, handles, feet, small cylinders that can be cut up to create other shapes. It's a valuable exercise in that it casts the wheel in a new light: more like a slab roller or an extruder. Not as a source of finished pieces but as a tool, to make shapes that then become pieces. Also, it's fun! Above is our collection of building blocks; below are some of the pots which arose from them. With 60-something minutes left, I am getting a jump-start on my project; reformulating my glazes to melt at ^6. I've been doing it in my head for a while now, of course, and today I am mixing up the first test that is not someone else's glaze (not that there's anything wrong with that!) but an attempt to alter my own glazes. Will it work? Well, I don't know! But it's starting point so my plan today is to mix up versions of many of my glazes with that simple switch. First test firing is April 24th. You can see more of Jennifer's work here. 44 hours left! Yeah, I'm shop-sitting today: too much time on my hands. 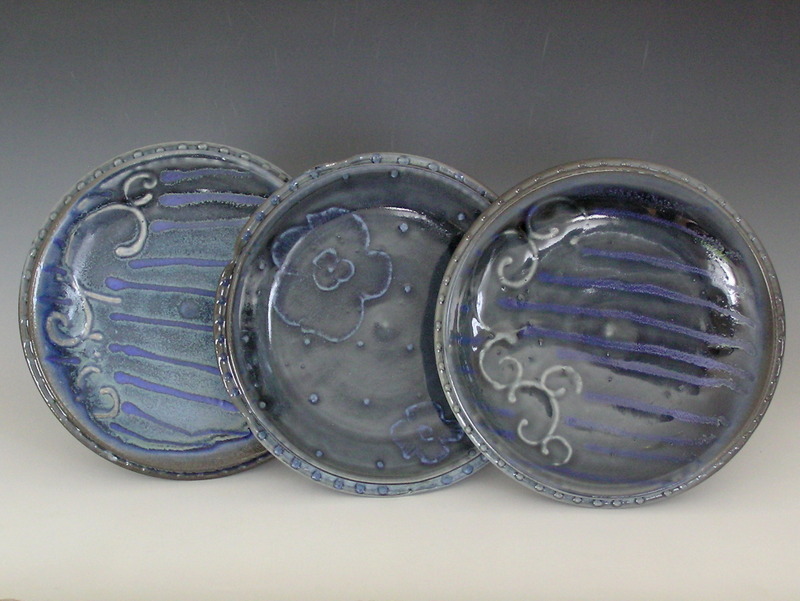 I posted a new item in the Pottery Shop: a set of three slip-trailed dessert plates, for $95. These defy some "set" conventions: for one thing, there are three of them, not four or eight or whatever. Also, they are close cousins rather than twins. But nevertheless the speak "set" to me. I find sets more intriguing when they seem to belong together without strictly matching. I get more pushback about the numbers, though. Why are four or six okay numbers for set but not three or five? Somehow I always seem to come up with odd numbers. It can't be coincidence; there must be something in the labyrinthian folds of my grey matter telling me that three or five seems right. 45 hours left as of 11:45 am on the Kickstarter clock, if you'd like to pre-order teabowls, casseroles, cheesecake, or glaze books! As of last night, my Kickstarter project, the one I have been posting about all month, reached its funding goal! SO happy and relieved! I can finally exhale the breathe I took on March 7th. Kickstarter is an all-or-nothing deal: if you don't reach 100%, you get nothing. But that's not gonna happen, YAY! The project is still active and taking pledges; there are still plenty of glaze notebooks, teabowls, casserole dishes and cake stands to be had. I'm told there's a flurry of activity in the last two days of a project: if so, that's all to the awesome. Lots of Kickstarter projects create "stretch" goals once they reach their goal, but it's not in my heart to ask for more when people have already been so generous. (On the other hand some of the rewards are really good deals! Glaze notebook, anyone?) Obviously I can find a use for additional funds, but I have what I need to do what I need. Thank you. On to the actual project! I just wanted to let you all know - especially my international readers - that I am now offering a PDF copy of the Fine Mess Glaze Notebook for a pledge of $29 on my Kickstarter project, Sweet Life. It will contain all of my recipes, ^6 and ^10, with firing notes. Previously this was only available in the US, but a Canadian potter sent me a request, and we found a solution. So! Click here to pledge & get your copy. Lisa & Lynn, thanks again for your help.